To design a Wireless network application, we will have to look at the building blocks of the solution first. Considering three classes of components needed to build the Wireless networks – mobility controllers, access points, and software. 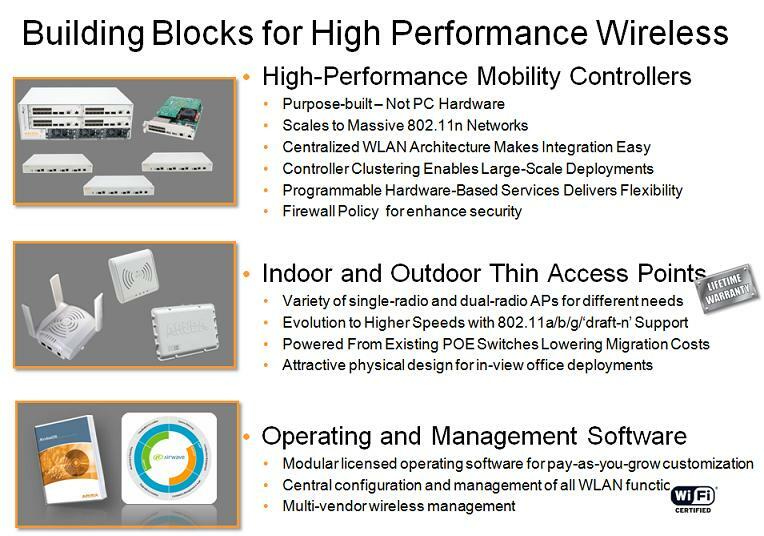 Providing the performance, scalability, and feature-richness needed Mobility Controllers, ranging in size from a small device that powers a handful of access points up to one that handles thousands of APs with 40Gbps of processing power. A mobility controller runs our operating system, called ArubaOS, and serves as a central collection point for traffic to and from mobile clients. There’s pretty specialized hardware in these controllers, including a dedicated control processor, a high-speed network processor, a dedicated hardware encryption/decryption engine, and on the highest-end unit an accelerator card that further speeds up performance. Without this kind of specialized hardware, at best you’re getting a PC that manages a bunch of APs, and at worst you’re getting a serious performance bottleneck. Nobody else in the market comes close to touching our capabilities, and that starts with this kind of hardware. Next in the lineup is a series of thin access points. We have APs for several different needs, from single radio to dual radio, from indoor to outdoor, and with or without redundancy options. 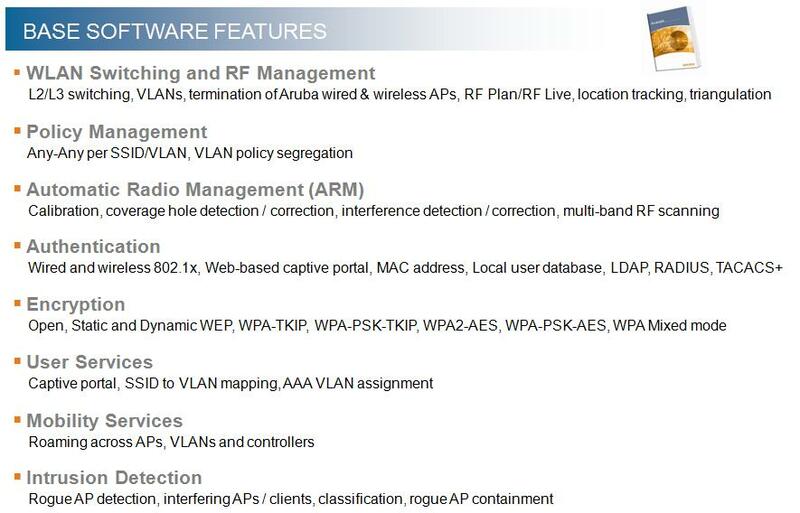 APs are where the radio hardware lives, and we have APs supporting all the popular Wi-Fi standards, including the newest “802.11n”. Beyond the hardware, it takes software to make everything run. We have two categories of software that we provide – the operating system that powers mobility controllers and APs, called ArubaOS, and multi-vendor management software called the AirWave Wireless Management Suite that lets you integrate wireless management into your existing network operations systems. Centralization is a big theme of our software – our customers found previous generations of wireless technology to be very expensive to operate because of their distributed nature. By centralizing functions like control and management, we can really reduce the TCO of these networks.